Lani, one of my grad school besties, started a food blog called Aloha Belly this year. How cute is the name? A darling nod to her Hawaiian roots. I love the glimpses she gives into her kitchen - lots of fresh ingredients, and meals you'll feel good about eating. 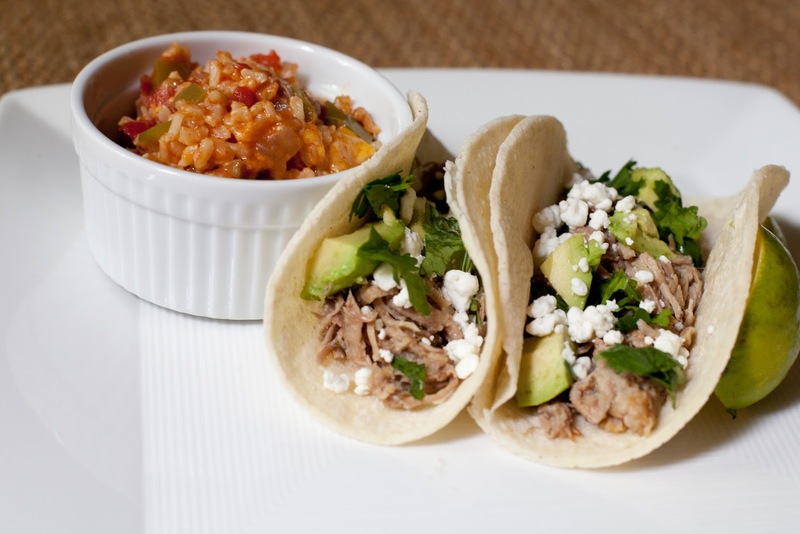 Recently, she posted a recipe for pork carnitas, and as soon as I saw it I knew we needed it for Taco Tuesday. The pork is simmered all day in a slow cooker, and comes out terrifically tender. We topped with avocado, queso fresco, cilantro and hot sauce. The pork was mildly flavored, which was perfect for using it as leftovers (I made rice bowls the next night, and also used the pork in quesadillas and on a salad for lunch). The recipe calls for a three pound pork shoulder, so unless you're having company, you'll probably have leftovers ;) Find the recipe here (and check out Lani's other fabulous recipes!). I served the pork tacos with some homemade Mexican rice (my own recipe I whipped up after consulting a few Pinterest recipes and also trying to incorporate our CSA veggies for the week). It was super easy to make the rice because the pork was making itself in the slow cooker. Goodness, I love our slow cooker. Sautee garlic, onion and bell pepper in oil over medium heat for 5 minutes. Add rice, tomatoes, chicken broth and spices. Bring to a boil, then reduce heat and cover. Simmer for 15 minutes if using white rice (I used brown rice and cooked for about half an hour). Remove from heat and stir in cheese until melty. Serve with your favorite tacos! Oh my gosh, this looks SO GOOD! We eat so many Mexican dishes, so I love to switch it up. (And, I love anything that cooks in the Crock Pot!) Thanks for sharing! !